Estoril has proudly been an independent hostel for the last 10 years, without being part of any worldwide chain or local franchise. We really like to think that our most important asset might be our personal guest care. We love what we do! Our hostel is housed in a beautiful 100-year-old building located within walking distance of great restaurants and many of the key sights. From here you will easily reach Florida Street, the Obelisk, the Colon Theater, Congress, the Presidential Residence (aka Casa Rosada), La Boca, San Telmo, Recoleta and each barrio of Buenos Aires that you’ll want to visit. Bus and subway stops can be found just metres from the Hostel! We have the small amenities that make all the difference. For instance, our internet and Wi-Fi connections are as fast as it gets in Buenos Aires. There is heating and air conditioning in rooms and common areas. We’ve got a bar upon on the rooftop, a famous breakfast, Spanish lessons, travel guides, tourist info and huge plasma TVs in both living rooms, with comfy couches and the latest DVD releases, updated every week. Of course, our most important feature is the people staying with us. 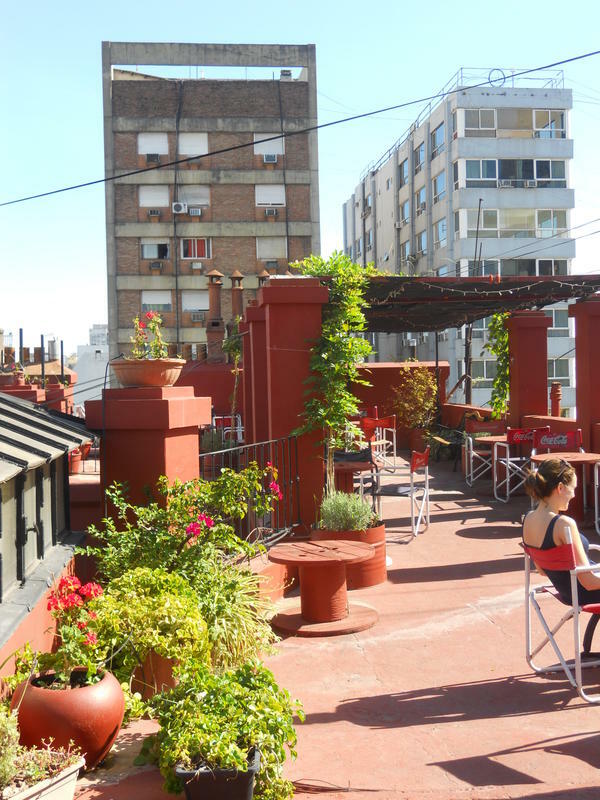 Every single guest booking at Hostel Estoril will have exclusive access to the building's rooftop terraces, bar and BBQ area in the spectacular heights of Buenos Aires, surrounded by a unique, amazing urban scenery. You will meet other travellers, enjoy a delicious BBQ or have a drink and relax under the stars. Please don't forget to take a look at the 'Facilities' detailed information below. Thank you for taking your time to read this, we are looking forward to see you soon! Bus N* 7 or 56 / Metro Line C (Avda. de Mayo Station) or A (Saenz Pena Station ). Taxi ride approx. 10/15 minutes.